Israeli soldiers abducted, on Thursday at dawn, three Palestinians from their homes in Salfit governorate, in central West Bank. 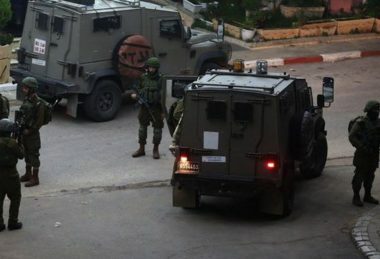 The Palestinian Prisoners Society (PPS) has reported that several army jeeps invaded Bruqin village, west of Salfit, and abducted Maher Zoheir Samara. It added that the soldiers also invaded and searched homes in az-Zawiya town, west of Salfit, and abducted Mahmoud Mohammad Raddad, 24. The soldiers also abducted Mohammad Hani Daoud, from his home in Hares village, north of Salfit. Furthermore, the soldiers invaded the homes of Zaki al-Khoffash, in addition to political prisoner Sa’id Eshteyya, and the secretary of Fateh Movement, in Salfit city, and violently searched them. It is worth mentioning that the villages of Kifl Hares and Haras remain isolated since Israeli installed iron gates on their entrances a few days ago. In related news, the soldiers closed the iron gate at the entrance of the al-Fawwar refugee camp, south of Hebron, in the southern part of the occupied West Bank, and prevented the Palestinians from entering or leaving it. The soldiers also invaded and searched homes in the towns of Bani Neim, Sa’ir and Beit Ummar, near Hebron, and the family of a journalist, identified as Ra’ed Sharif, in Hebron city, in one room while searching and ransacking their homes.